At Brinker Capital, we think that broadly diversified, thoughtfully constructed, and dynamically allocated portfolios can deliver more consistent risk-adjusted returns, keeping investors invested. Our solutions are based on our multi-asset class approach and are comprised of a mix of growth, stable, and diversifying assets to better enable investors to focus on outcomes. We are pleased to introduce a new monthly communication that will provide you with relevant information to help you better serve your clients and have more informed conversations. [Webinar Replay] How much is left in the tank? Click the image to the left and register to access the replay (registration required). Listen to Brinker Capital investment professionals, Jeff Raupp, CFA and Tim Holland, CFA, as they provide their thoughts concerning the economic cycle and market cycle as we move through 2019. [Presentation slides] How much is left in the tank? Click here for the presentation slides from Brinker Capital’s webinar titled, “How much is left in the tank”. Important information around the 2018 tax season including forms, report instructions, and tax form mailing schedule. Destinations Funds Trust portfolio estimated gains distributions and estimated mutual fund distributions as of December 14, 2018. Learn about the steps Brinker Capital takes throughout the year to help manage your client’s taxes. Listen to Brinker Capital investment professionals, Jeff Raupp, CFA and Tim Holland, CFA, as they provide their thoughts concerning policy, the economy, and the markets after the mid-term elections. Click here for the presentation slides from Brinker Capital’s Post election webinar. Listen as Thomas K.R. Wilson, Managing Director of Wealth Advisory, Senior Investment Manager, provides timely and relevant information that will help prepare you with the answers to clients’ tough questions. Click here to access the presentation slides from the Wealth Advisory Webinar that covers timely and relevant topics to help address critical questions this quarter from the minds of investors. Listen to Brinker Capital investment professionals Jeff Raupp, CFA, Tim Holland, CFA, and Amy Magnotta, CFA, as they provide a look back at 3Q2018 asset class returns and an outlook to the fourth quarter. Click here for the presentation slides from Brinker Capital’s 4Q2018 market and economic outlook webinar. We incorporate our best ideas into portfolios, so that they reflect our most up-to-date approaches for the short and long term. An intensive, team-based approach enables us to generate ideas, drawing on our long experience and newest insights. All of this supplies you with a ready source for intelligent, useful solutions. Sample proposal for Destinations ETFh portfolios. Sample proposal for Personal Benchmark. Sample proposal for Core Guided. Register to attend the Client Service webinar on Thursday, September 13 hosted by Stan Warchol, Vice President, Client Services. For existing financial advisors and their support staff. Brinker Capital Wealth Advisory fees. The Wealth Advisory team empowers you to offer an exclusive investment experience to your clients with at least at $1M of investable assets. We incorporate our best ideas into portfolios to reflect our most up-to-date approaches for the short and long term. An intensive, team-based approach enables us to generate ideas, drawing on our extensive experience and current insight. All of this supplies you with a ready source for intelligent, useful solutions. Brinker Capital Wealth Advisory offers a tailored investment solution for high net worth and institutional investors with at least $1 million in investable assets. On April 14, Chuck Widger, Brinker Capital’s Founder & Executive Chairman, joined a group of 15 private sector investors for dinner with former Federal Reserve Chairwoman, Dr. Janet Yellen. The power of winning by not losing. In a money-obsessed world that has socialized us to chase the almighty dollar, it can be weirdly unsettling to learn that money isn’t everything. This article discusses what advisors and clients can do to protect their identity. Listen as Chris Hart and Andrew Goins cover performance, manager highlights, and platform activity in the second quarter. For existing Core Asset Manager financial advisors only. Click here for the presentation slides from the 2Q2018 Core Asset Manager webinar hosted by Chris Hart and Andrew Goins. Click here to access the presentation slides from the 2Q2018 Destinations on-demand webinar. For existing Destinations financial advisors only. Listen as Amy Magnotta, CFA and Leigh Lowman, CFA give a portfolio and performance update of Destinations in the second quarter of 2018. Provides a detailed description of the Personal Benchmark solution. Register to attend the Brinker Capital market & economic outlook webinar with Jeff Raupp, CFA, and Tim Holland, CFA as they provide a look back at 2Q asset class returns and an outlook to the third quarter. Listen as Jason Moore and Amy Magnotta discuss the reallocation of the Destinations taxable portfolios containing third-party mutual funds to begin including the Destinations Funds. Click here for the presentation slides from the Destinations taxable portfolio reallocation webinar hosted by Jason Moore and Amy Magnotta. Annualized manager and benchmark performance for the Core Asset Manager Program. High level overview of Core product offering including Select and Guided. Fees are listed on the back. The PENN Small Cap Equity style seeks to achieve capital appreciation from investments in publicly traded, small capitalization companies. The strategy’s objective is to outperform the S&P 500 Index by focusing on stocks that are attractively valued with improving prospects. Wasmer, Schroeder & Company’s Strategic Tax Exempt Fixed Income style seeks to maximize tax exempt income without duration or maturity restrictions. Combining fundamental and ESG inputs to create a diversified portfolio of global stocks seeking long-term capital appreciation. To participate in up markets while outperforming the Russell 1000 Growth Index, with less volatility, over a full market cycle. To provide above-market income, defend in down markets, and outperform the Russell 200 Value Index, with less volatility, over a full market cycle. Long-term capital appreciation through investment in equity securities of companies based outside of the United States. Listen to the conference call replay as Jeff Raupp, CFA, Director of Investments and Amy Magnotta, CFA, Senior Vice President and Head of Discretionary Portfolios provide context around the recent market activity. Important updates regarding the Core Guided program. For existing Core Guided financial advisors only. Overview of Brinker Capital’s investment beliefs, philosophy and collaborative process. This includes a deeper look into the asset allocation and manager research and selection processes, as well as portfolio construction and ongoing monitoring. Listen to the 2018 kick off webinar that provides an update on Brinker Capital’s Fiduciary Focus, security and technology, as well as an overall outlook for 2018. Click here for the presentation slides from Brinker Capital’s Fiduciary Focus webinar. The strategy seeks to track the S&P 1500® Index on a pre-tax basis by investing in a subset of securities from within the index. Taxable accounts may utilize loss harvesting and tax management techniques to seek outperformance on an after-tax basis. The strategy seeks to track the S&P 600® Index on a pre-tax basis by investing in a subset of securities from within the index. Taxable accounts may utilize loss harvesting and tax management techniques to seek outperformance on an after-tax basis. Brinker Capital RIA Services Provides the Community, Technology, and Support to Help RIAs Grow Their Business. While our political discourse can dominate headlines and drive investor sentiment over the near-term, the stock market ultimately focuses on monetary policy, fiscal policy, and economic fundamentals, not politics. BERWYN, Pa. (April 10, 2017) – Brinker Capital, a leading investment management firm focused on multi-asset class investing, today announced the launch of the Destinations Funds (the Funds), a series of 10 multi-manager mutual funds advised by Brinker Capital. The Funds now serve as the building blocks of the Destinations fee-based mutual fund advisory portfolios, which launched in 1995 and currently have $9.3 billion in assets under management (as of March 31, 2017). This announcement comes as the firm is set to celebrate its 30th anniversary on April 17. BERWYN, Pa. (April 5, 2017) – Brinker Capital, a leading investment management firm focused on multi-asset class investing, today announced the expansion of its investment team with three key appointments: Tim Holland, CFA as Senior Vice President, Global Investment Strategist and Vice Chair of the Asset Allocation Committee; Amy Magnotta, CFA as Senior Vice President, Head of Discretionary Portfolios and Chair of the Asset Allocation Committee; and Jeff Raupp, CFA as Director of Investments and Chair of the Investment Group Executive Committee. Destinations ETFh portfolios offer different balances of risk and reward, depending on an investor’s risk tolerance, and time horizon. They’re all designed to offer consistent, competitive performance while seeking to achieve better risk-adjusted returns over the long-term. Brinker Capital Retirement Plan Services works with advisors to provide investment solutions to serve the various needs of plan sponsors and plan participants. 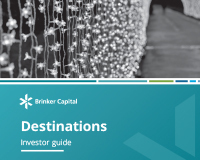 Destinations is an investment solution that utilizes a multi-asset class approach through a variety of allocation portfolios, each targeting a specific investment objective. This guide will help you better understand the Performance Report and can be used as a tool to deepen the relationship with your client. As a service to our taxable clients, each year we offer you the opportunity to realize gains or losses in your taxable Core Asset Manager, Destinations ETFh, and Personal Portfolios accounts. If your accounts have unrealized losses, these losses could be used to offset gains you may have realized earlier this year. This may help to reduce the capital gains tax you will pay for the year end 2018. If your accounts have unrealized gains, these gains could be used to offset losses you may have realized earlier this year or have carried forward from previous year(s). To track the performance of a target index on a pre-tax basis while adding alpha on an after-tax basis through systematic tax loss harvesting. Strategic Research seeks to generate a premium to the broad U.S. market by integrating top-down investment themes with bottom-up security selection. Seeks to achieve long-term capital growth by investing in a diversified portfolio of common stocks of small growth-oriented companies. Seeks to achieve long-term capital growth by investing in a diversified portfolio of common stocks of small and mid-cap growth-oriented companies. To provide growth with lower volatility than a typical equity offering. To preserve and enhance clients’ wealth while assuming moderate levels of risk. The main objective of Ladder PLUS is income generation and preservation of principal. while there are many bond ladders out there, this ladder has an opportunistic overlay based on the concept that everything has a price. The strategy directive is to provide income and safety with a focus on total return. attractive excess returns relative to the Russell Midcap Index. The US Mid Cap Growth Equity strategy seeks to outperform the Russell Midcap Growth Index over a long-term investment horizon. The objective of the portfolio is to outperform the Russell Midcap Value Index over the long term while producing lower risk scores versus their peers. The objective of the portfolio is to outperform the Russell 2000 Index over the long term while providing lower-risk scores verses their peers. Seeks to outperform the Russell 1000 Growth Index over a three-to-five year time horizon. Seeks to provide superior, consistent returns over the full market cycle. long-term returns by investing in higher quality, attractively valued stocks. Active management of high-quality municipal securities for total return that seeks to preserve the client’s principal while providing a hedge against inflation and meet or exceed the benchmark, Barclays Capital Municipal Bond Index. Active management of high-quality taxable bond portfolios for total return that seeks to preserve the client’s principal and meet or exceed the benchmark, Barclays Capital Intermediate Gov./Credit Index. Seeks to provide maximum long-term total return, consistent with reasonable risk, through investments in stocks that have the potential for capital appreciation. Perform favorably versus the Barclays Aggregate Index with less credit risk and lower interest rate exposure. Perform favorably versus the Barclays Intermediate Government and Credit Index with less credit risk. Seeks to provide superior performance to style specific (Russell 1000 Growth) benchmarks. GW&K’s objective is to provide clients with a fully diversified portfolio of small and mid cap stocks that participates in rising markets while protecting during market downturns. Seeks capital preservation with an emphasis on income generation as a key component to competitive total returns while minimizing risk volatility. Seeks long-term growth of capital by translating Invesco’s earnings-driven approach for domestic stock selection to overseas markets. Strategy is designed to outperform the Russell 2000 Growth index by identifying small cap companies with a growing asset base, a stable or growing return on invested capital and at attractive valuation levels. Lazard International Equity Select ADR seeks to generate strong relative returns over a longterm time horizon by investing in companies with strong financial productivity at attractive valuations. Lazard Global Equity Select seeks to generate strong relative returns over a long-term time horizon by investing in companies with strong and/or improving financial productivity at attractive valuations. The fund seeks long-term capital growth by investing primarily in stocks of small cap companies. Seeks to provide consistent dividend income above the MSCI EAFE index average as well as outperform the index with less volatility over a full market cycle. Seeks to participate in up markets and defend in down markets while outperforming the Russell 1000 Index, with less volatility, over a full market cycle. The investment objective of the product is to provide superior returns versus the Russell 1000 Growth Index with less volatility. This strategy’s investment objective is current income with a secondary objective of capital appreciation. Our focus is on downside protection. Capital preservation is our highest investment priority. To achieve superior, long-term capital appreciation by investing in highest conviction stocks internationally through the use of ADRs. The objective of MFS’ Large Cap Value Equity discipline is to seek capital appreciation and reasonable current income. To provide investors with liquidity, above market yields and preservation of capital by investing in a portfolio of short duration tax free bonds. To provide investors with liquidity, above market yields and preservation of capital by investing in a portfolio of short duration government bonds. The team seeks long-term capital growth and participation in the global equity market, excluding the U.S., through investment in diversified equities. Portfolio’s objective is to deliver an attractive dividend, total return and risk profile relative to our primary benchmark over a complete market cycle. To design client portfolios that focus on total return performance while seeking to provide consistent income that enhances the entire portfolio. Deliver long-term growth of capital investing in a concentrated portfolio of small-cap companies with strong fundamentals. Seeks maximum total return through investment in an intermediate-term portfolio of primarily high quality bonds. The strategy seeks to provide total return consisting of long-term capital appreciation and income. Using real estate stocks to provide returns over a full market cycle comparable to those experienced by direct owners of commercial real estate. To provide a sustainable and substantial level of current income by maximizing cash flows while preserving capital and assuming the least possible risk. Maximum current income and strong total return potential in all market cycles by investing in corporate bonds and preferred stocks across the maturity spectrum. Capital preservation, tax-free income, and total return in all market cycles investing in investment-grade municipal securities with short and intermediate-term maturity. Capital preservation, tax-free income, and total return in all market cycles investing in investment-grade municipal securities with seven year maturity. Total return and invests in undervalued partnerships that offer the potential for current income and capital appreciation while seeking tax efficiency. The Portfolio invests in companies with low valuation where Smith Group believes management is taking steps to change future cash flows to exceed investor expectations. Translate earnings and cash flow growth into superior risk-adjusted portfolio returns. We are growth investors who employ a bottom-up stock selection. Find high-quality, undervalued companies with superior financial strength, strong free cash flows and lower relative levels of debt we believe will outperform over market cycle. Long-term capital appreciation using a value-oriented investment approach with an emphasis on dividends. Goal is to outperform our benchmark, the Russell 1000 Growth Index in both up and down markets over full market cycles. Seeks to provide a current income stream, moderate level of volatility and the opportunity for long-term growth of capital. Seeks to provide current income, long-term growth of capital and a moderate level of volatility. Seeks to provide current income, maximize long-term capital appreciation and maintain a moderately aggressive level of volatility. Seeks to provide current income and maximize long-term capital appreciation. Seeks to provide current income and uses primarily equities to maximize long-term capital appreciation that exceeds inflation. Seeks to provide current income, low level of volatility and some growth potential. Seeks to provide current income, low level of volatility and outpace U.S. Treasury Bills by 1-3% over rolling 12 month periods. Any time a client needs something or you have a question or concern, you have access to a dedicated team of professionals. Working on the time-tested principle of “buy low, sell high,” Brinker Capital has thoughtfully and systematically built the Dollar Value Averaging (DVA) strategy. The charts and information in this document provide you with product highlights and commentary. Led by your financial advisor, your investment team will work with you to identify your investment and spending goals, structure appropriate solutions and monitor your portfolio so that they can guide you towards achieving your objectives. Brinker Capital Personal Benchmark is a packaged investment solution designed to help investors manage the emotions of investing. Seeks to provide a high level of current income, inflation protection and moderate level of volatility.